DEARBORN, Mo. — North Platte dialed up its trademark pressure late in the first quarter Friday, Jan. 9 at North Platte High School. The Panthers took further control of its KCI Conference rivalry matchup with West Platte, not allowing the Bluejays to score for more than 12 minutes. North Platte remained unbeaten with a 46-24 victory. 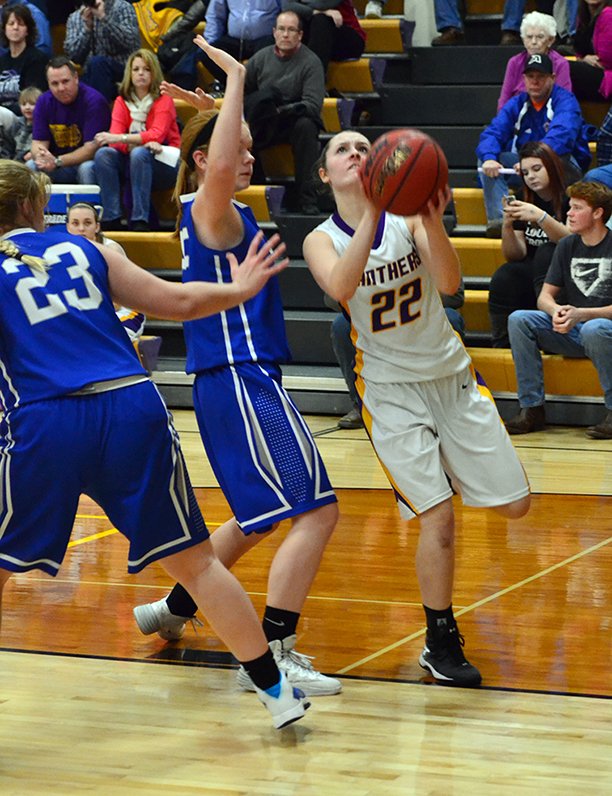 North Platte senior forward Chelsi Sams and junior guard Erin Manville scored 10 points each, helping the Panthers improve to 10-0 on the season and 2-0 in league play entering their game in the Lawson Invitational on Tuesday, Jan 13. North Platte won the tournament last year en route to a one-loss regular season. The result of Tuesday’s game was not available at The Citizen’s deadline. North Platte retained its No. 2 ranking in the Missouri Basketball Coaches Association Class 2 poll released on Jan. 7. The Panthers sit behind defending Class 2 state champions Crane (13-1). West Platte rebounded from its 12-plus-minute scoring drought to score 20 points in the second half. Taylor Binkley ended the scoreless spell at the free throw line 1 minute, 42 seconds into the third quarter. The junior guard finished with a team-high nine points — seven in the second half. Mattie Vandel, West Platte’s lone senior, added six on two fourth-quarter 3-pointers. West Platte also traveled to play in the Lawson Invitational as the No. 7 seed. No. 2 seed Hamilton awaited the Bluejays in a Tuesday, Jan. 13 opening-round matchup. Hamilton won the previous matchup between the two teams 43-28 in the opening round of December’s KCI Conference Tournament. The result of the rematch was not available at The Citizen’s deadline. There is no seventh-place game in the Lawson Tournament much like the KCI Conference Tournament in which the Bluejays exited after two games with a loss to Lawson in the consolation bracket.